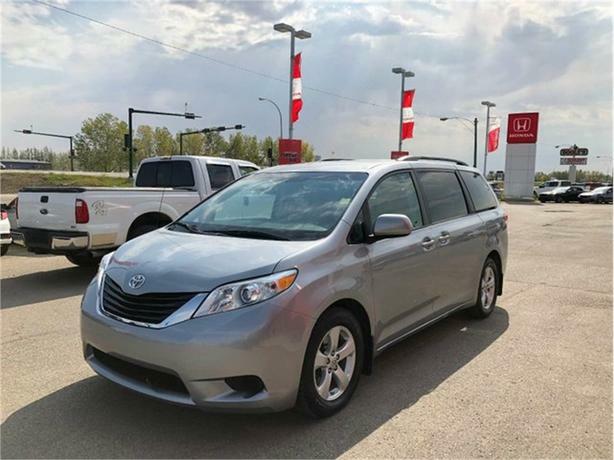 Roomy and sensible, this 2011 Toyota Sienna LE is a perfect balance for any lifestyle. The "Silver Sky Metallic" exterior is in excellent condition paired with a grey cloth interior. The 3.5L V6 engine has loads of explosive power for when you need it but also achieves decent fuel economy for those commutes with the family. This Sienna has been regularly serviced and maintained. For your peace of mind, our certified technicians performed an extensive multi-point, comprehensive used vehicle inspection on this vehicle. other than an oil & filter change, a new power steering rack, new brake pads and rotors all around and a few other maintenance items, nothing more was needed to ensure this quality FWD is in optimal driving condition and more than ready for its next proud owners! Features on the LE include 17-inch alloy wheels, tri-zone manual climate control, CD/MP3 stereo with auxiliary input, XM satellite pre-wiring, easy-clean fabric upholstery, removable second-row captain's chairs, 60/40 split-folding third-row seat, auto up/down windows, power door locks with keyless entry, ECO driving indicator, dual illuminated vanity mirrors, conversation mirror, tilt and telescopic steering wheel, carpet floor mats, cruise control, overhead console box with sunglasses storage, illuminated entry, driver's knee airbag, active front head restraints, locking glovebox, tire pressure monitoring system, rear privacy glass, heated mirrors, front and rear splash guards, roof rails, rear spoiler, variable intermittent wipers, windshield de-icer, and rear washer/wiper. The LE V6 builds on the LE and adds Bluetooth connectivity, USB audio input, XM satellite radio, steering wheel-mounted audio controls, power driver's seat, 40/20/40 second-row stowable centre seat, multi-information display, outside temperature gauge, auto-dimming rear-view mirror, compass, back-up camera, front centre console box, dual sliding doors, garage door opener, and second- and third-row retractable sunshades.